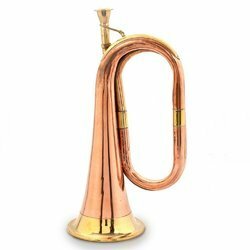 Providing you the best range of brass tuba, brass sousaphone, gold euphonium, brass cornet, tenor trombones and brass bugle with effective & timely delivery. A tuba with its tubing wrapped for placing the instrument on the player's lap is usually called a concert tuba or simply a tuba. Tubas with the bell pointing forward (Pavillon tournament) instead of upward are often called recording tubas because of their popularity in the early days of recorded music, as their sound could more easily be directed at the recording microphone. When wrapped to surround the body for cavalry bands on horseback or marching, it is traditionally known as a hélicon. 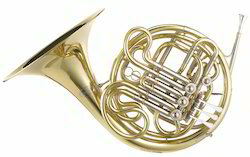 The modern sousaphone, named after American bandmaster John Philip Sousa, resembles a hélicon with the bell pointed up and then curved to point forward. Some ancestors of the tuba, such as the military bombardon, had the unusual valve and bore arrangements compared to modern tubas. During the American Civil War, most brass bands used a branch of the brass family known as saxhorns, which, by today's standards, have a narrower bore taper than tuba—the same as true cornets and baritones, but distinct from trumpets, euphoniums, and others with different tapers or no taper. Around the start of the Civil War, saxhorns manufactured for military use in the USA were commonly wrapped with the bell pointing backward over the player's shoulder, and these were known as over-the-shoulder saxhorns, and came in sizes from cornets down to E♭ basses. 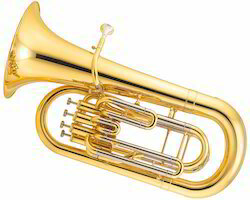 However, the E♭ bass, even though it shared the same tube length as a modern E♭ tuba, has a narrower bore and as such cannot be called by the name 'tuba' except as a convenience when comparing it to other sizes of Saxhorn. The sousaphone is basically a tuba that coils around the body with a flared bell that faces forward. As such, it is similar to the tuba in how it is played. The main difference is the sousaphone wraps around the performer's body to make the instrument easier to carry in marching bands. 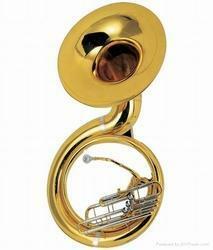 It is It is made of the same brass material and can also be silver plated like a tuba. Many of the popular models are made of a fiberglass material that make it much lighter in weight, designed for more comfort when carried for long periods. Most sousaphones have only three valves. The sousaphone is played in the same manner as all other brass instruments. The performer vibrates his/her lips against the mouthpiece producing a tone, and the pitch is controlled by three valves. Sousaphones can be pitched in nearly any key. Most sousaphones are in the key of B-flat, however, it is not unusual to find instruments in E-flat. The sousaphone notes sound at the same octave as written, so it is a non-transposing instrument. The lowest note written for the sousaphone is the F1 below the bass clef staff. The high range goes to the F1 above the bass clef staff. A professional performer can extend the range more than an octave above this and extend the low pitches into the pedal range of the instrument. The concertmaster Sommer of Weimar designed the euphonium in 1843, which was a wide-bored valved bugle in the baritone range. This instrument was then called the Euphonium. 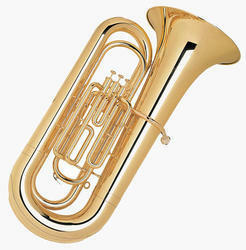 A brass instrument of the tuba family, smaller and higher in pitch than a tuba, with a range of B♭1 below the bass clef to B♭4 in the treble clef. This instrument is mostly used in concert bands and military bands. The euphonium has taken the place of Richard Wagner's tenor tuba. All of the music originally written for the tenor tuba is now typically performed on the euphonium. The euphonium is constructed in the way that it looks like a miniature tuba. It contains a conical bore and a flared bell, with four valves. The sound is produced with the euphonium by the performer vibrating his/her lips against the mouthpiece. A very mellow and smooth tone is produced from the instrument without the pitch problems that occurred and plagued the Wagner tubas, but the euphonium is only used to replace the tenor tuba. The euphonium’s range is the same as the bass trombone starting in the bass clef ranging from B♭1 below the bass clef to B♭4 above the bass clef. The euphonium is also a non-transposing instrument. The cornet is a brass instrument very similar to the trumpet, distinguished by its conical bore, compact shape, and mellower tone quality. The most common cornet is a transposing instrument in B♭ though there is also a soprano cornet in E♭. Both are unrelated to the renaissance and early baroque cornett. Extending the slide from one position to the next lowers the pitch by one semitone. Thus, each note in the harmonic series can be lowered by an interval of up to a tritone. The lowest note of the standard instrument is therefore an E natural a tritone below B♭. 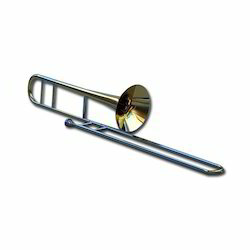 Most experienced trombonists can play lower "falset" notes and much lower pedal notes (first partials or fundamentals, which have a peculiar metallic rumbling sound). Slide positions are subject to adjustment, compensating for imperfections in the tuning of different harmonics. 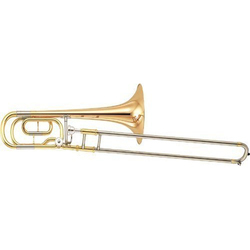 The fifth partial is rather flat on most trombones and usually requires a minute shortening of the slide position to compensate; other small adjustments are also normally required throughout the range. Trombonists make frequent use of alternate positions to minimize slide movement in rapid passages; for instance, B♭3 may be played in first or fifth position. Alternate positions are also needed to allow a player to produce a glissando to or from a higher note on the same partial. The Brass bugle is one of the simplest brass instruments, having no valves or other pitch-altering devices. All pitch control is done by varying the player's embouchure. Consequently, the bugle is limited to notes within the harmonic series. See bugle call for scores to standard bugle calls, all consisting of only five notes. These notes are known as the bugle scale. Pitch is controlled through the adjustment of lip tension in the mouthpiece and the operation of valves by the left hand, which route the air into the extra tubing. Most horns have lever-operated rotary valves, but some, especially older horns, use piston valves (similar to a trumpet) and the Vienna horn uses double-piston valves, or pump valves. The backward facing orientation of the bell relates to the perceived desirability to create a subdued sound, in concert situations, in contrast to the more-piercing quality of the trumpet. A horn without valves is known as a natural horn, changing pitch along the natural harmonics of the instrument (similar to a bugle). Pitch may also be controlled by the position of the hand in the bell, in effect reducing the bell's diameter. The pitch of any note can easily be raised or lowered by adjusting the hand position in the bell. 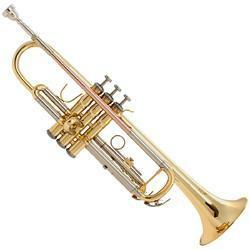 The trumpet is constructed of brass tubing bent twice into a rounded oblong shape. As with all brass instruments, the sound is produced by blowing air through closed lips, producing a "buzzing" sound into the mouthpiece and starting a standing wave vibration in the air column inside the trumpet. The player can select the pitch from a range of overtones or harmonics by changing the lip aperture and tension (known as the embouchure). The mouthpiece has a circular rim, which provides a comfortable environment for the lips' vibration. Directly behind the rim is the cup, which channels the air into a much smaller opening (the back bore or shank) that tapers out slightly to match the diameter of the trumpet's lead pipe. The dimensions of these parts of the mouthpiece affect the timbre or quality of sound, the ease of playability, and player comfort. Generally, the wider and deeper the cup, the darker the sound and timbre. Modern trumpets have three (or infrequently four) piston valves, each of which increases the length of tubing when engaged, thereby lowering the pitch. The first valve lowers the instrument's pitch by a whole step (2 semitones), the second valve by a half step (1 semitone), and the third valve by one-and-a-half steps (3 semitones). When a fourth valve is present, as with some piccolo trumpets, it usually lowers the pitch a perfect fourth (5 semitones). Used singly and in combination these valves make the instrument fully chromatic, i.e., able to play all twelve pitches of classical music. For more information about the different types of valves, see Brass instrument valves.